To preserve my equipment, I use a hot wax mixture Instead of painting. I am space and time limited, so I was very interested in this method, as it is quick, does not require space for drying, and should last much longer than paint or stain. I was further motivated after I read that it is a method that can sterilize equipment - including killing AFB spores. It is often recommended in countries where antibiotics are not used. Here is a fact sheet from the New Zealand Government on the process. The tank is stainless, and filled with a mixture of 2:1 paraffin to microcrystalline wax. 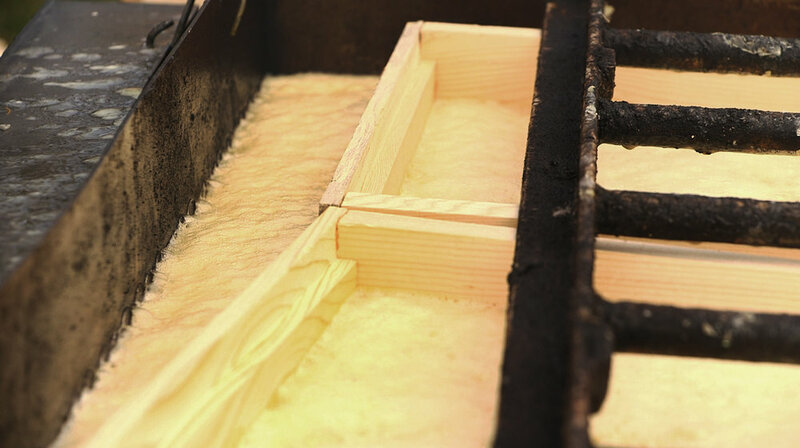 The wax is heated to 160 Celsius (320 Fahrenheit), and the boxes are submerged for 10 minutes. The water within the boxes boils out, and it is replaced with wax. The boxes are ready to go as soon as they are dry, and should last for decades. The melter contains about 700 lbs of wax, so it takes a really long time to melt. I don’t use it that frequently, because I like to have at least 60 boxes ready to dip before it is worth it to use. Usually I’ll dip my equipment one day, and other beekeepers the next day. If you are interested in having your equipment dipped, please read the FAQs at the bottom of this page. If you are interested in making your own dipper, please read more info on the wax dipping specs page. When is the next wax dipping date? There is no date scheduled at the moment. I usually try to do one in the fall, and one in the spring. I will likely not have any more public dip days in 2018, and I plan to have one in March 2019. Please make sure you are signed up for my mailing list if you are interested in being made aware of future dates. I like to have at least 60 boxes to get it fired up, since it takes a full propane tank just to melt the wax. If you work with other beekeepers to get together enough equipment, I can schedule an extra day when you can drop it off, and I can get everything dipped. If you don’t get up to 60, let me know, because I may have a stack waiting to be done. I do not count this as part of my business, so I just try to have my costs covered - the wax and propane, and if I have help for that day. I as for about $4/ box or box equivalent to cover those costs. Can I dip used equipment? You can dip used equipment, as long as it is clean and dry. Please make sure to remove all dirt, dust, dead bees, cobwebs etc that will gum up the bottom of the melter. If you suspect AFB or other disease, please give me a heads up first. The melter can sterilize AFB spores, but I would want to make sure that we take all precautions to not spread any pathogens during the process. Can the equipment be painted? Yes. Most of the time the paint is just fine. I have had a few colors fade in the melter (an orange turned to light yellow). You can also paint the boxes immediately after dipping (before they cool), if you want them painted a particular color. You'll have to do that yourself, but we can set you up with a tarp and water. Does the equipment have to be assembled? No, you can also dip unassembled boxes and woodenware. The wax goes into the wood, so it doesn't change the size of anything. Can I dip metal parts like screened bottom boards and telescoping covers? You can, but the wax will cling to the metal. It may fill in some of the holes on the bottom board (unless you immediately wipe it), and it will dull the shine on the lid. It will work fine, but you may not like the way it looks. Why don't you use beeswax? Beeswax melts at too low of a temperature. If I use beeswax the boxes will get all sticky in the heat, and the dirt will stick to them. The paraffin/ microcrystilline mix is designed to remain hard in the summer heat, and will actually impregnate the wood. I can do about 6 boxes at a time, and it takes about 15 minutes per round. After they come out of the melter, it takes only about a minute for them to cool and dry, and they are ready to go. 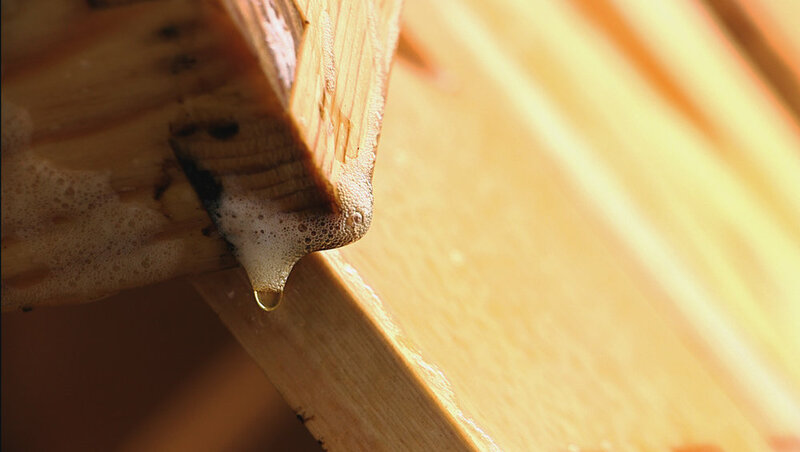 If there is a lot of moisture in the wood, it tends to cool the wax (as the water boils out). It may take a while for the wax to reheat after a few rounds. Usually I can do a quite a few rounds, and then I have to let it heat up for 20 minutes or so. No, you don't. If you want to wait, you are more than welcome to hang out, talk bees, or even make frames in the wood shop (mine or yours!). I don't take appointments, and we are at the mercy of the weather and the wood moisture, so I can't guarantee that I can do it immediately. You are more than welcome to drop off your equipment well ahead of time, and pick it up after. If you drop off equipment, EVERY piece of equipment must be labeled with your name. I will leave a pallet by the American Flag pole, and you can leave your equipment there, and pick it up after the weekend is over and it is done. Do I need to organize with you or schedule an appointment? Not really, though it is good to check before you come out to make sure it is still happening. We have had to switch weekends before because of pouring rain or heavy wind. If it is bad, you can always just leave the equipment, and I'll do it when the weather turns and I have time.